Additional Info: en-suite, gated side decking. 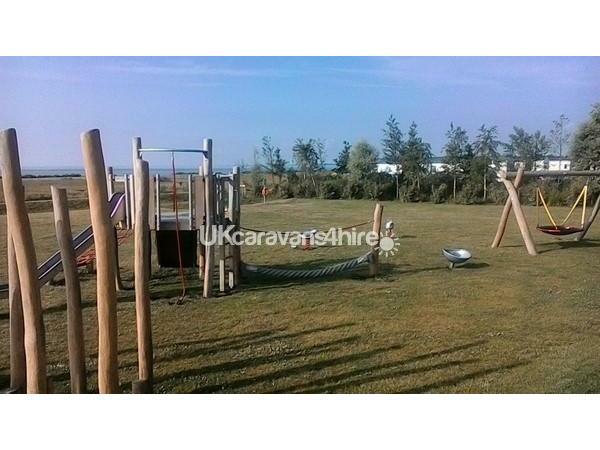 Very dog friendly site next to Country Park with amazing play park. Short breaks available 3/4/7 nights. Please enquire. Walnut Way is on a quiet site right by the sea and adjoins a Country Park. The caravan has a spacious lounge with TV and DVD player. The dining area is next to sliding doors that open onto a side decking with sea view with a table and chairs. The kitchen is well equipped including fridge freezer, microwave, full size oven and gas hob. The main bedroom is roomy with an en-suite and large wardrobe. The other bedroom has twin beds. Bed linen is provided with beds made ready. Towels included but bring your own for beach and indoor heated swimming pool. Tea coffee sugar and milk are ready for your arrival. A well behaved dog is welcome. The price also includes club passes for the clubhouse and indoor heated swimming pool. There is a shop on site, a children's play area and a large grass area for games or kite flying. You have your own parking space next to the caravan. Adjoining Country Park with amazing play park. Lots of lovely walks 13 miles around the island. Dog friendly beaches. Colchester , Britain's oldest recorded town 15 minutes away. Castle, castle park, zoo. Additional Info: Indoor heated swimming pool, clubhouse with entertainment, shop, children park, laundry stunning views and country and coastal walks. Foot ferry to Brightlingsea, Point Clear and Colchester Hythe.5 minutes drive to West Mersea Town with restaurants and takeaways and assorted shops . 15 minutes away from Colchester zoo and Colchester town (Britains oldest recorded town) and castle. No reviews found. If you have recently stayed in this holiday home please leave a review, it only takes a few moments and will really help future guests when they are searching for holiday accommodation at Mersea Island Holiday Park.